With the possibility of causing some serious damage and carrying some dangerous diseases, raccoons can be a real problem for homeowners and businesses. Though their small, furry appearance might not appear to be menacing, raccoons can make a real mess of your yard, empty the contents of your trash can, and make a mess of your home if they get in and decide they would like to stay. They are a known nuisance – the best bet is to call a wildlife control professional to remove the critters. They’re not the kind of furry creature you want hanging around your property. Our team works diligently to remove the raccoon population from your area as quickly, efficiently, and humanely as possible, without causing damage to your property. 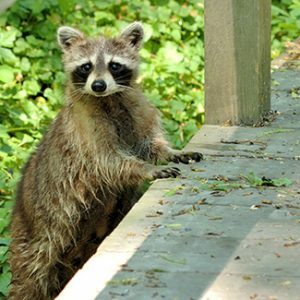 Our 25 years in the wildlife removal industry has given us the experience that Houston residents and business owners need when they need reliable raccoon removal services. Our techs don’t merely scare raccoons away – we do what they can to keep them away. Simple wildlife traps alone won’t work with raccoons. Instead, we bait, capture and relocate the raccoons to a place where they won’t cause trouble. Our wildlife control services are available for Houston and its surrounding areas. Call us with your wildlife concerns today – we promise reliable wildlife removal services for your home and office. How Can I Protect My Home From Raccoon Damage?